Warren Sheppard, was an American marine painter, born in Greenwich, New Jersey on April 10,1858. He lived most of his life in the New York, New Jersey area, spending summers in New Hampshire, painting seascapes off Isles of Shoals. He learned the art of marine painting under the Dutch Maritime artist Mauritz Frederick Hendrick de Haas, who had moved to America, settling in New York in 1858, the same year that Sheppard was born. Although he worked closely with the master, Sheppard was able to develop an original style, and maintain his own views on the portrayal of nature. 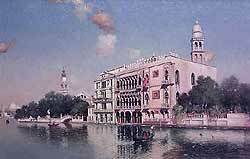 In the 1890's Sheppard painted a group of Venetian scenes. Recording the architecture along the Grand Canal, Sheppard painted many private villas, betraying the oriental influences on the architecture of the original plans of this unusual city. From 1880 to 1899, he exhibited at the National Academy of Design were he showed many paintings, among them Moonrise on the Ocean, which commanded $1,500 in 1896. Sheppard was not only a talented marine painter, but he was also known for his expertise as a racing yachts designer and navigator. He died on February 23, 1937.